We are up at 6am, since it will be a long day of traveling.I spot a Kingfisher on the Zambezi at dawn just outside my veranda. We have a full English breakfast at Shackletons this morning and then we are on our way. We turn at Kazungula and arrive at the Zambian side of the Zambezi River crossing. We get our Zambian exit visa, say goodbye to our driver Jacob, and then catch a private launch across the river to Botswana. The Kazungula vehicle ferry also crosses the Zambezi, however one of the two ferries is out of service, so trucks are waiting up to two weeks to cross the river in either direction. The two governments plan to build a bridge some day. First stop is a Chobe River boat cruise. We spend the next few hours motoring slowly along the Chobe River and see lots of wildlife. Lunch and snacks are included, so it is a very pleasant start to the day. We spend several hours cruising slowly watching lots of wildlife along the Chobe River, right on the border between Botswana, Zambia and Namibia. Lunch and snacks are included, and since the boat is covered and only has the two of us on it, we have a very pleasant start to the day. Both Ernst and I are kept very busy taking both still photos and video. The game are quite close, and the boat provides a reasonably steady platform for photography. I don’t forget to use my binoculars as well – the extra magnification and image stabilization make animal observation very rewarding. The Chobe River boat cruise is one way, so at the end we transfer to a Land Cruiser to continue our journey to Lynanti Camp. 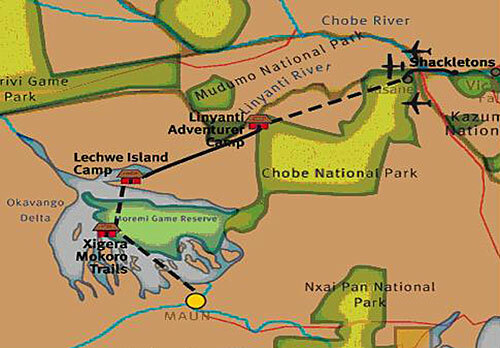 Originally we were scheduled to fly to Linyanti Camp, and then drive from Linyanti to Lechwe Camp, but due to flooding in the Okavango Delta, the road from Linyanti to Lechwe is impassable, so those arrangements are now reversed. Linyanti Camp is a very long 70km drive from Kasane in our Jeep Land Cruiser. After clearing Botswana customs at 1:30pm, we are on the road all afternoon, arriving at Linyanti Camp at 6pm. It is a punishing ride through a highway made of soft sand, however along the way there are lots of game to see: African Fish Eagles, Lilac Breasted Rollers, Giraffes, Buffalo, Warthogs, and Zebras. Just before we arrive at the camp, we see three female lions resting beside the shoreline at sunset. One female is older and thinner and the other two are younger. They all seem to be fat and happy, and they don’t bat an eye as we pull right up to them in our Land Cruiser. Drinks and dinner are waiting for us when we arrive in Linyanti Camp after dark, thanks to the camp staff. As I lie in bed this evening, I hear Hippopotamus in the spillway just a few metres from my tent flap. This entry was posted in Botswana, Zambia and tagged boat, river, safari. Bookmark the permalink.